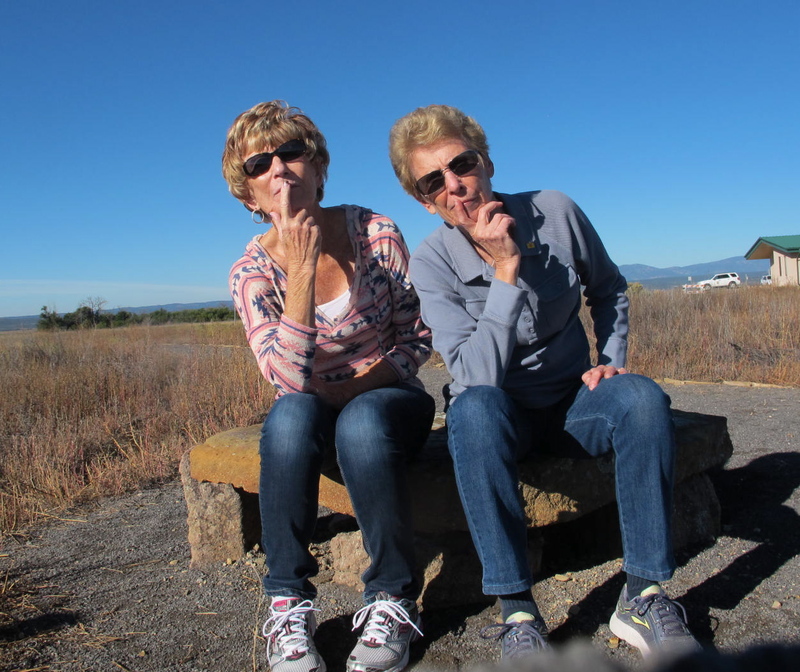 Jerri and I were certainly enchanted by northern New Mexico…a land of handsome people, savory food, stunning hues and dazzling, yet harmonious vistas. Our sixth Sister Trip was a great success and so much fun! 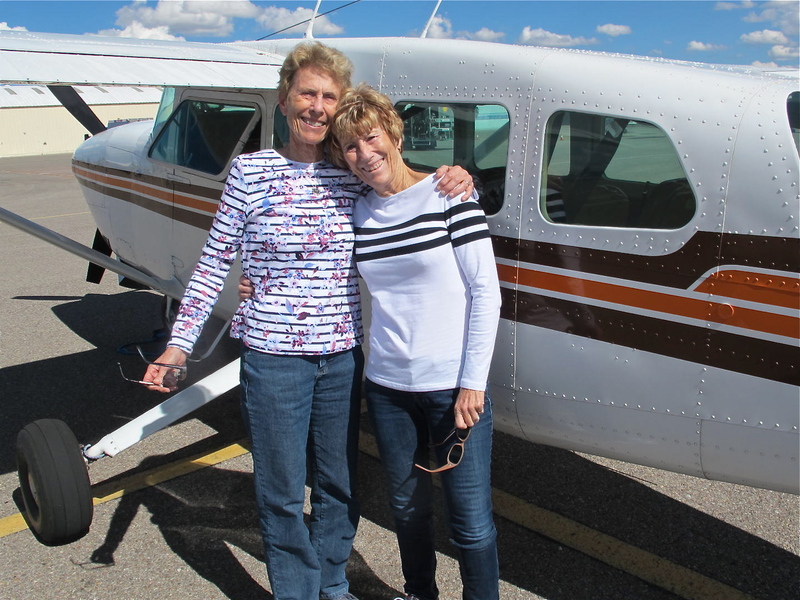 We flew into Albuquerque and drove immediately to Little Anita’s in Old Town where we enjoyed a scrumptious lunch. 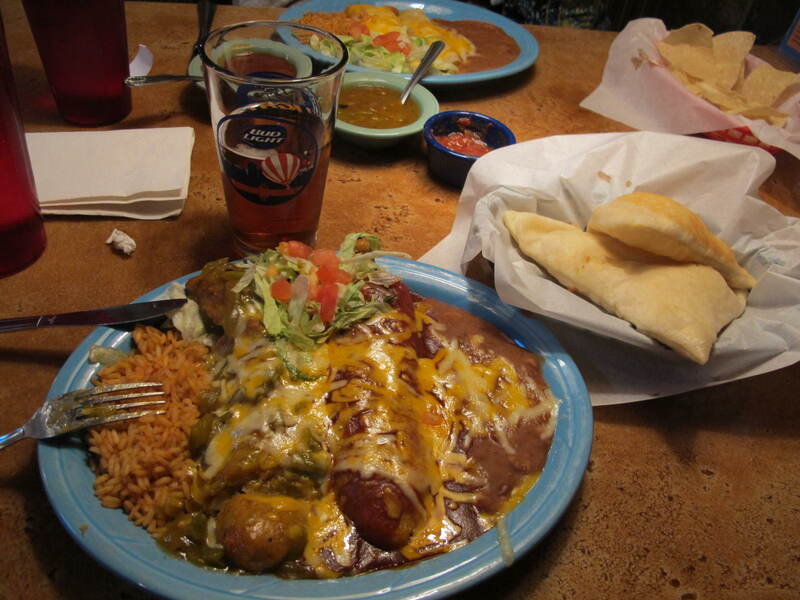 I covet New Mexican chile and those exquisite sopapillas. Oh my goodness! I was in chile ecstasy! Jerri even liked the tasty tang of the chile. This is the little Cessna that took us on our flight adventure. 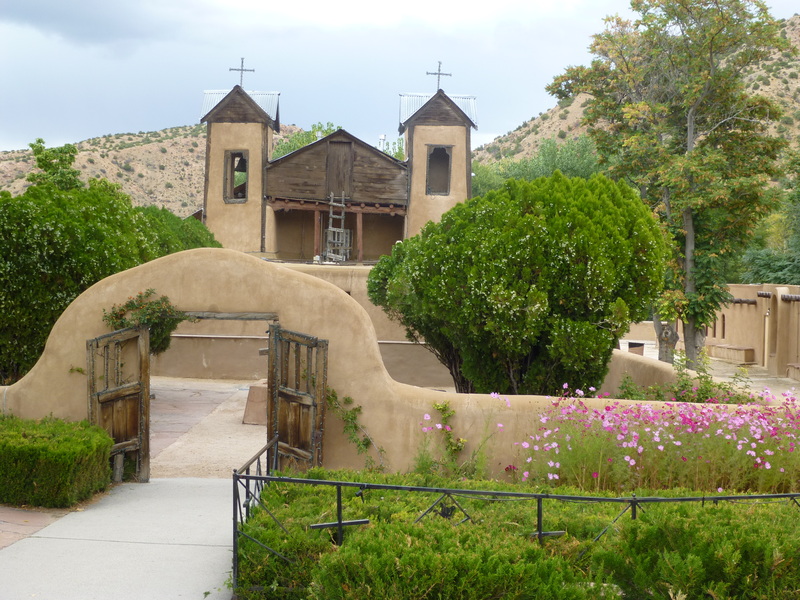 I found it interesting that Santa Fe’s original name was La Villa Real de la Santa Fe de San Francisco de Asís, the Royal Town of the Holy Faith of Saint Francis of Assisi. 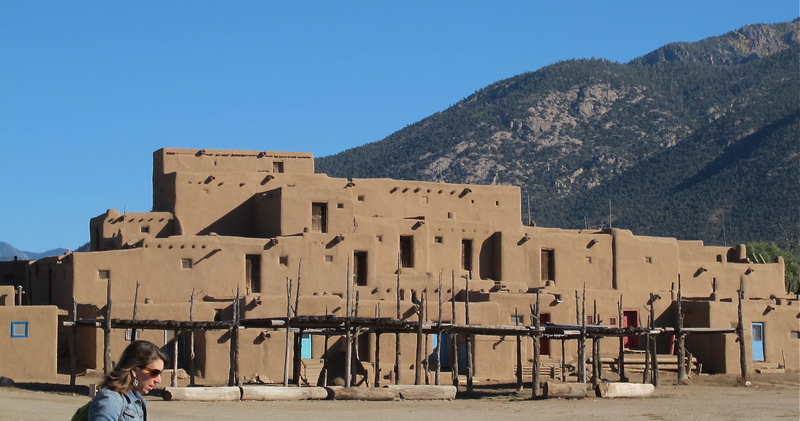 It is at the foot of the Sangre de Cristo Mountains and is the oldest continually lived in capital in the US, having been declared a capital in 1610 by the Spanish. We visited some of the interesting churches in Santa Fe. 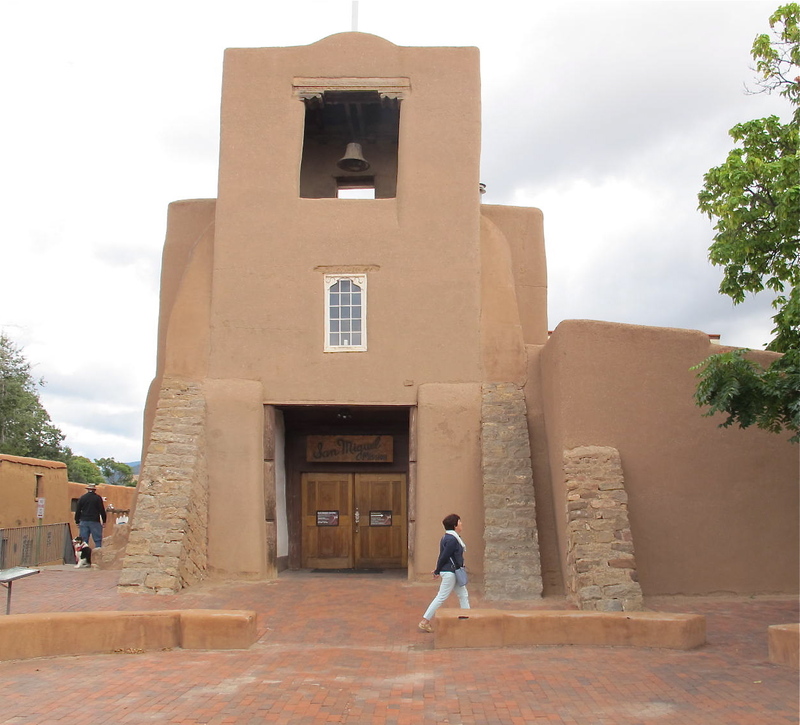 The first was San Miguel Church, the oldest church structure in the USA, ca. 1610. You can still see some of the straw that was used in the adobe (although, I suspect the some of the adobe has been restored over the years) It seems sort of timeless, doesn’t it? The story is that builders of the chapel forgot to construct a staircase to the choir loft. While they were trying to decide what to do about the problem, an anonymous carpenter arrived to fashion spiral steps with two 360-degree turns with no visible means of support. He used only wooden pegs in his work. Legend suggests that St. Joseph, the patron saint of carpenters, inspired the work. 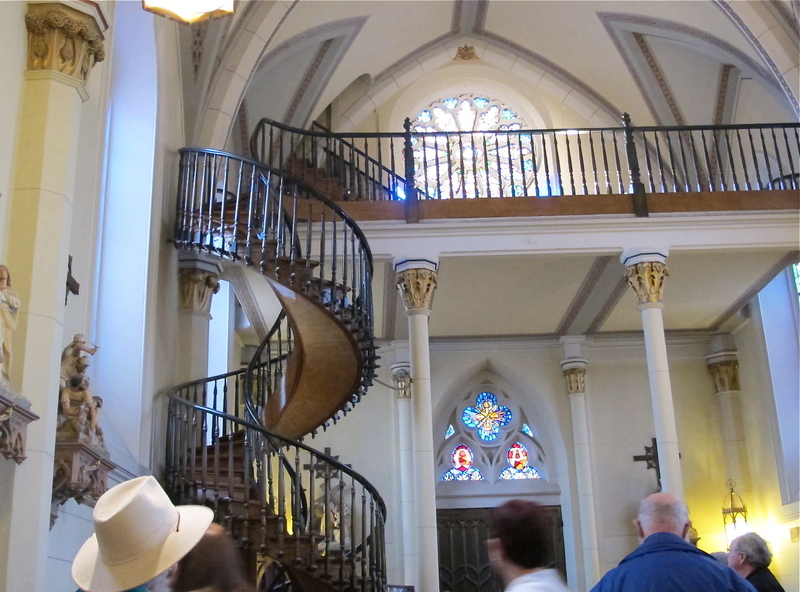 Whatever the truth is, Loretto Chapel is beautiful. 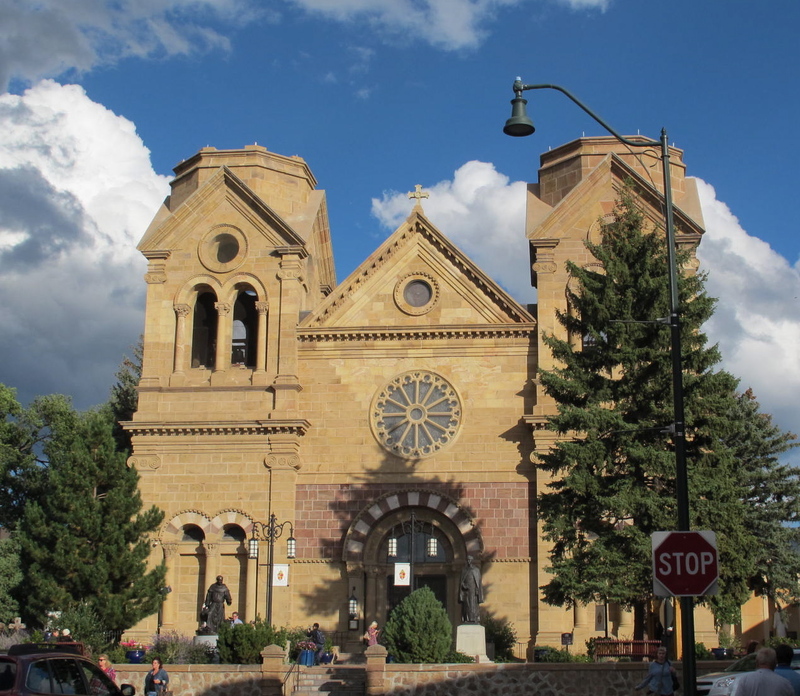 The next church is the Cathedral Basilica of St. Francis of Assisi. The parish was founded in 1610, but the present church was built in 1869. I didn’t get the timing just right, but, to me, the church appears to be glowing when the sun is getting low in the sky. We next visited the Palace of the Governors that is considered to be one of the oldest public service buildings in the United States. 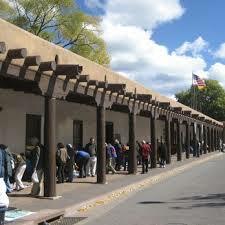 It is a long, low building with 4-foot-thick walls and was the seat of government under Spanish, Pueblo Indian, Mexican and U.S. territorial rule until 1909, when it became the state history museum. Today, the front area along the walls is lined with Native American artisans selling the wares they have made. It was interesting to walk along and see the elegant, wonderful pieces of jewelry and other art pieces and then hear people discussing prices. Sometimes, some haggling was heard. For some reason, I didn’t get a picture of the Palace, so I borrowed one from the internet. The Plaza is right across the street and was a great place to eat our lunch. There were several musicians, more art and some food vendors to entertain us while we munched on lunch. 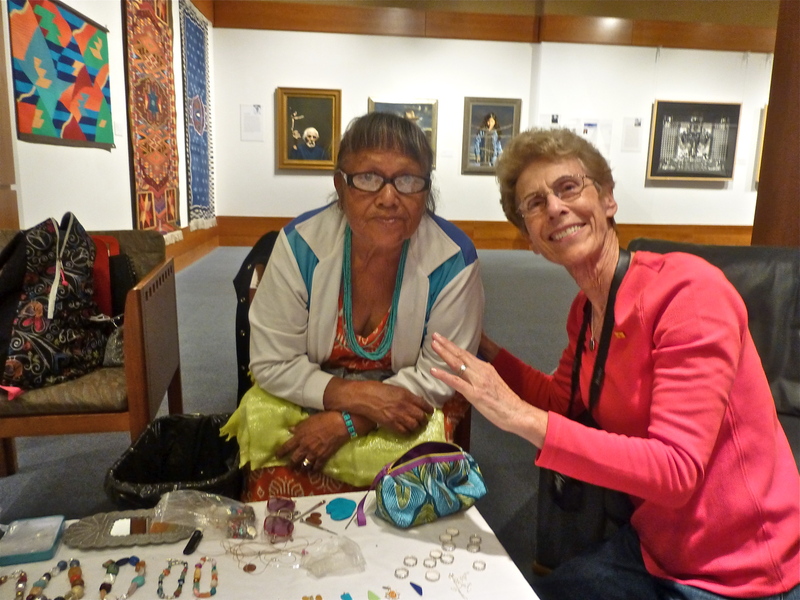 We did tour the Palace and adjoining New Mexico History Museum and really enjoyed it. 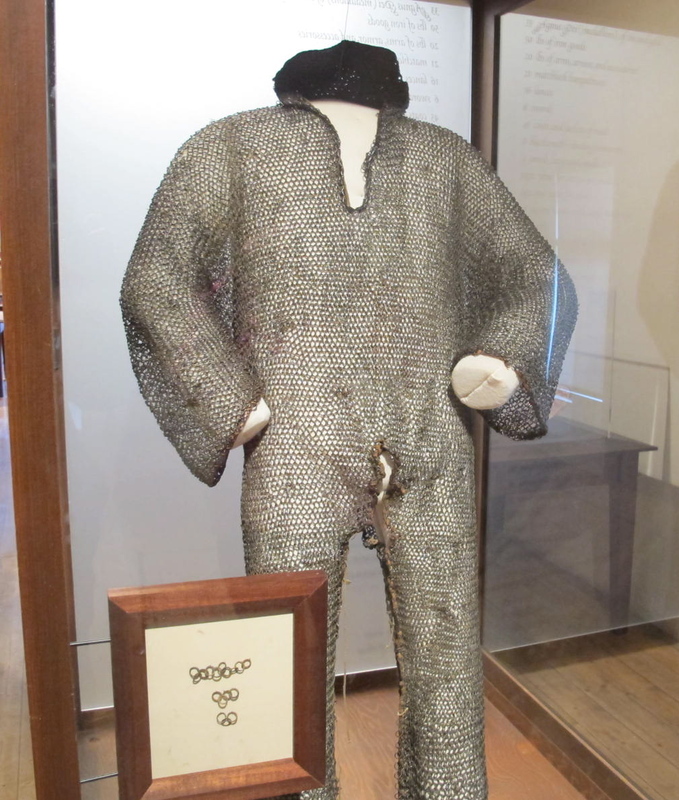 This chain link armor does not look very comfortable, especially during the summer months in New Mexico. 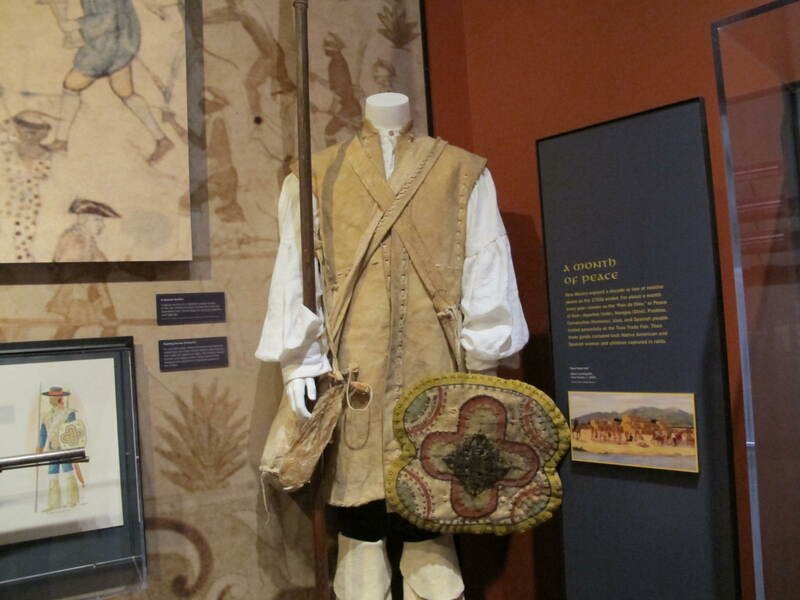 The soldier’s uniform of the late 1700’s was a bit more practical. We joked that if our rental car broke down, we’d come back and get this old pickup. Santa Fe has so many things to see that we had to skip some of the famous places. 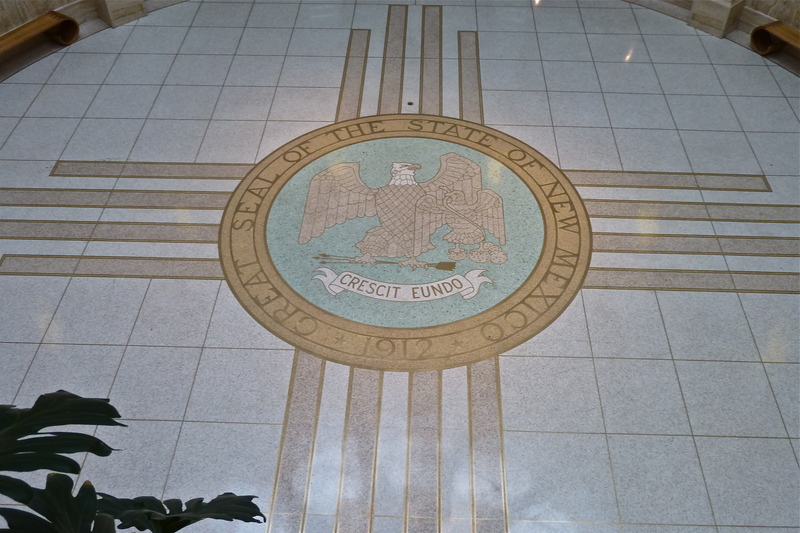 But we did not skip the New Mexico State Capitol. It’s an interesting building shaped like its state emblem, the Zia sun symbol. We learned that $6.2 million worth of art are housed in the capitol. We were fascinated with a lot of it. We wandered into the governor’s office and chatted with the receptionist, viewed some prize-winning art and met a wonderful lady named Josie from the Santo Domingo tribe (the proper term might be band or family). She had on display jewelry that she had made. We didn’t ask how she got to be there, but I bet there is not another governor’s office that has a Josie. Jerri and I each bought some pieces from her and she was kind enough to let Jerri take her picture. 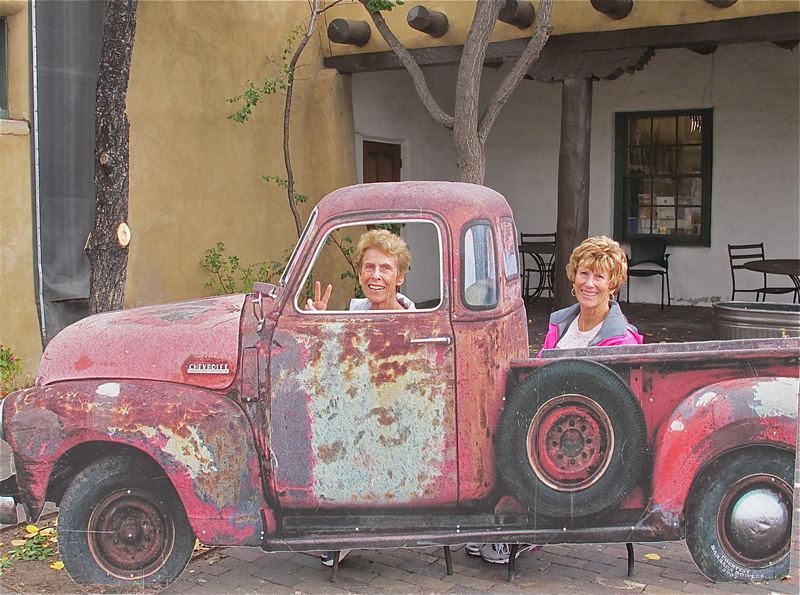 One of our stops after Santa Fe was El Santuario de Chimayo in the tiny town of the same name. Legend maintains that the earth surrounding a cross (that was found in the area in 1810) has healing power. Many pilgrims come to touch the dirt in a pit inside the chapel to be healed and the chapel is now lined with many crutches, braces and pictures of those who have been healed. Jerri had a badly sprained foot and we took some dirt home for her and also some for an ailing friend. We pray this helps both folks. 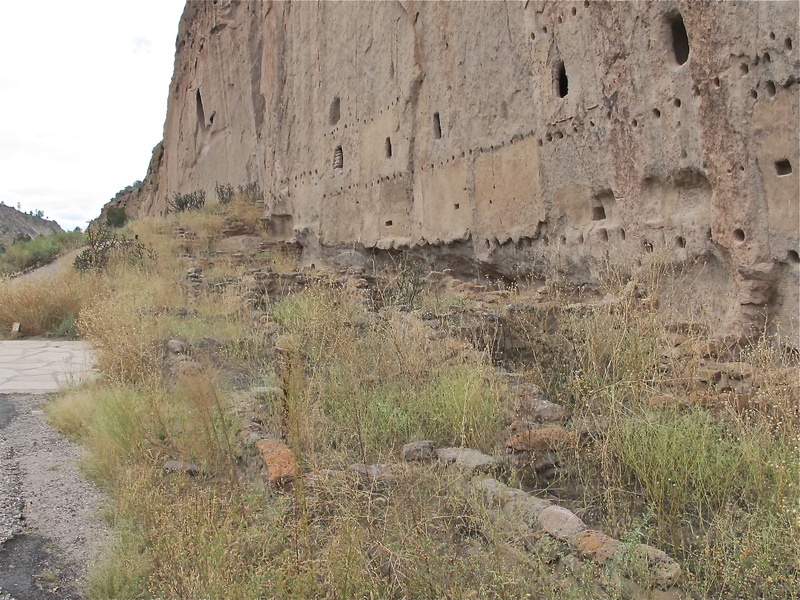 Another stop was the Bandelier National Monument. What a cool place this is. 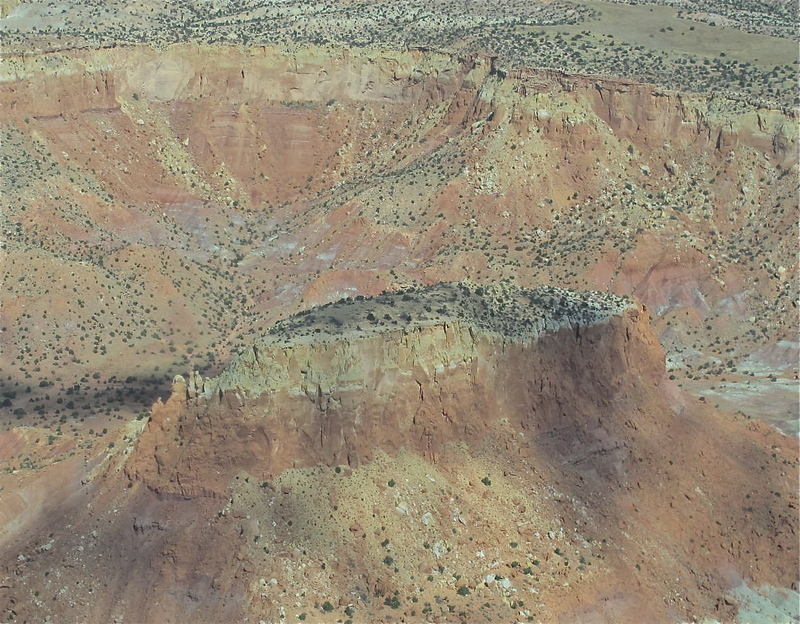 It is in the Frijoles Canyon and is a place where Ancestral Pueblo people lived in as many as 3,000 sites (not all at the same time). The largest populations lived there during the 1200s and some villages included as many as 40 rooms. 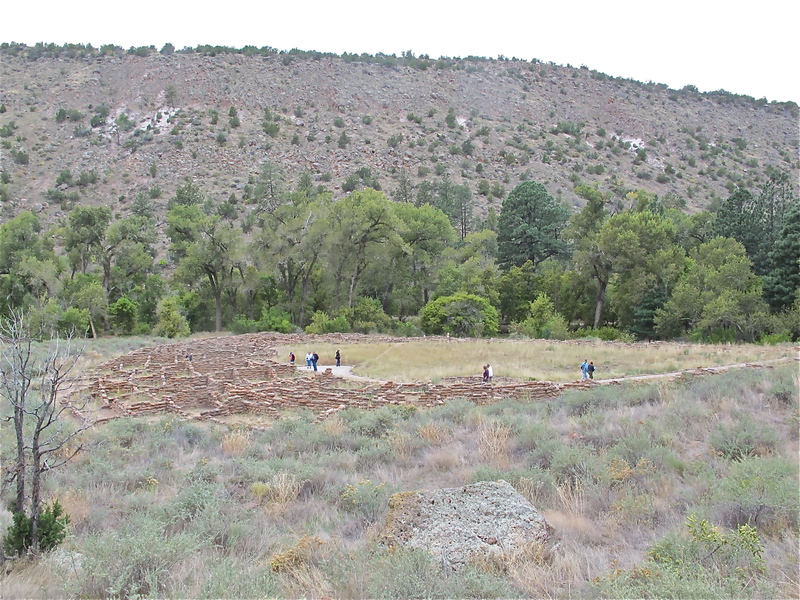 Some of the people lived in circular pueblos with kivas in the center part. 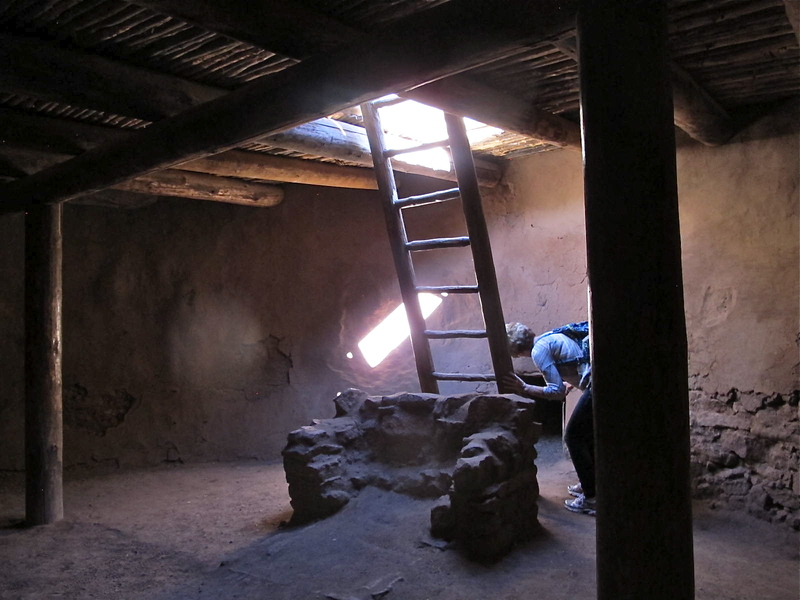 Some parts of the circuar pueblo were at least three stories tall. 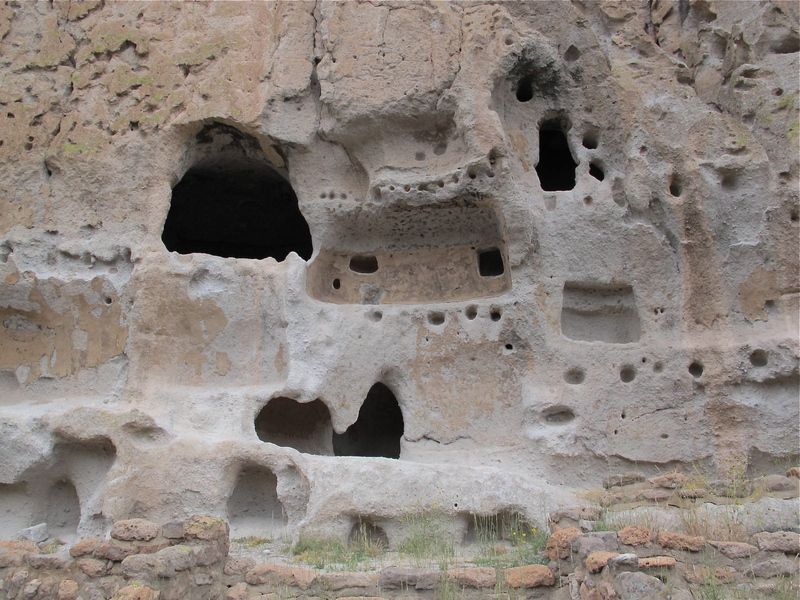 The part that Jerri and I were fascinated with was the cave houses. 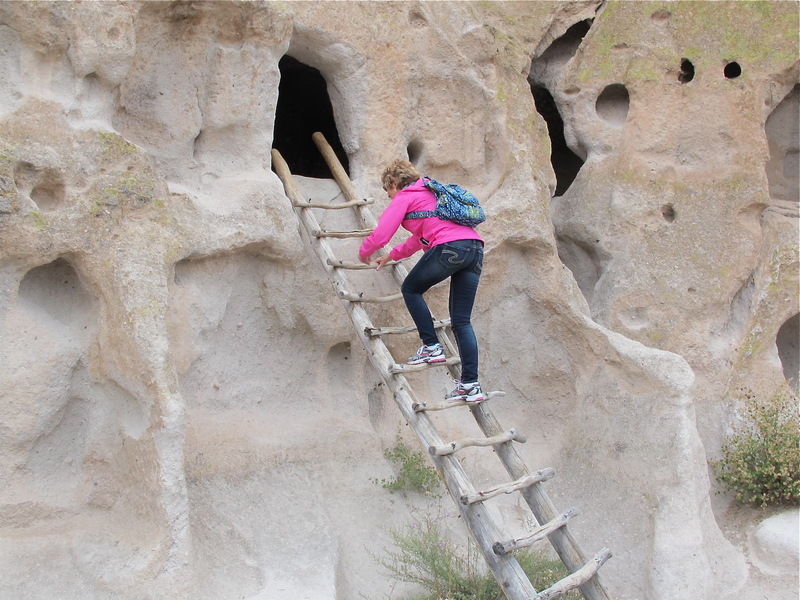 Jerri is climbing a ladder to one of the caves. Some of the caves had two or three rooms. I surely do hope they had some type of bear robe or perhaps rabbit skins to lie on. A stone floor would be pretty hard after a while. The Long House is an 800-foot stretch of adjoining, multi-storied stone homes with hand-carved caves as back rooms. You can see pole holes for the viga (large wood timbers)) in the cliff where they put in some support structure. These structures could have been up to 3 or maybe 4 stories tall. 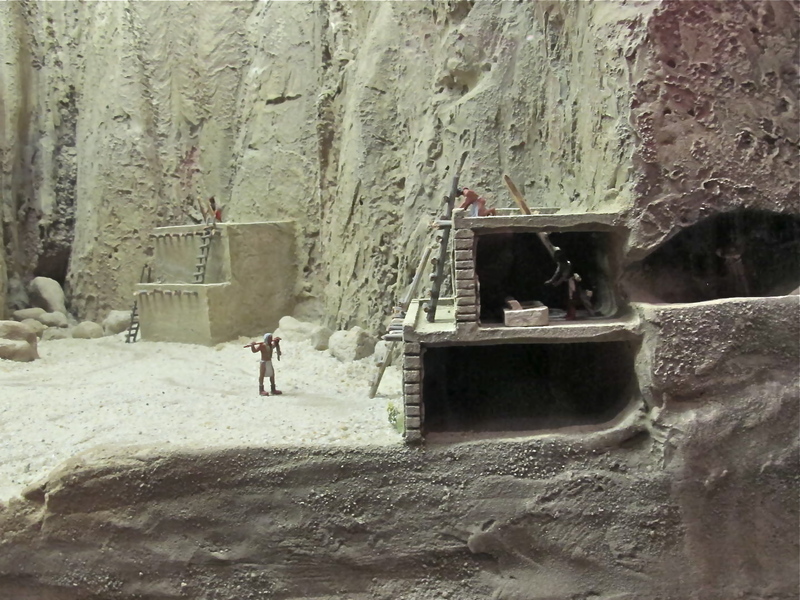 Diorama picture of how caves were dug in back of the houses. It kind of reminds me of a critter’s den in how it’s shaped. The stone was tuff, which is relatively soft but still would have been difficult to sculpt caves using stone tools. 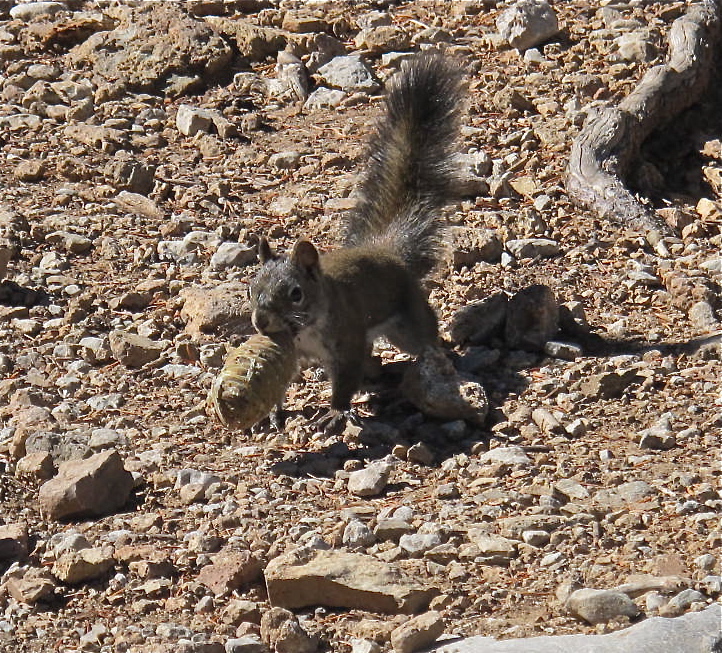 We had been lamenting that we hadn’t seen any critters bigger than locusts, stink bugs or caterpillars when we espied an Abert’s Squirrel. They are cute little devils but too quick for the camera. I tried to download a picture from the ‘net, but couldn’t get a good one. So here is the next best thing. Taos was our next destination. What a jewel it is. The mountains are resplendent and somewhat mystical with all their colors showing off to humankind. We loved it! Of course we visited the Taos Pueblo, one of the oldest continuously inhabited communities in North America. 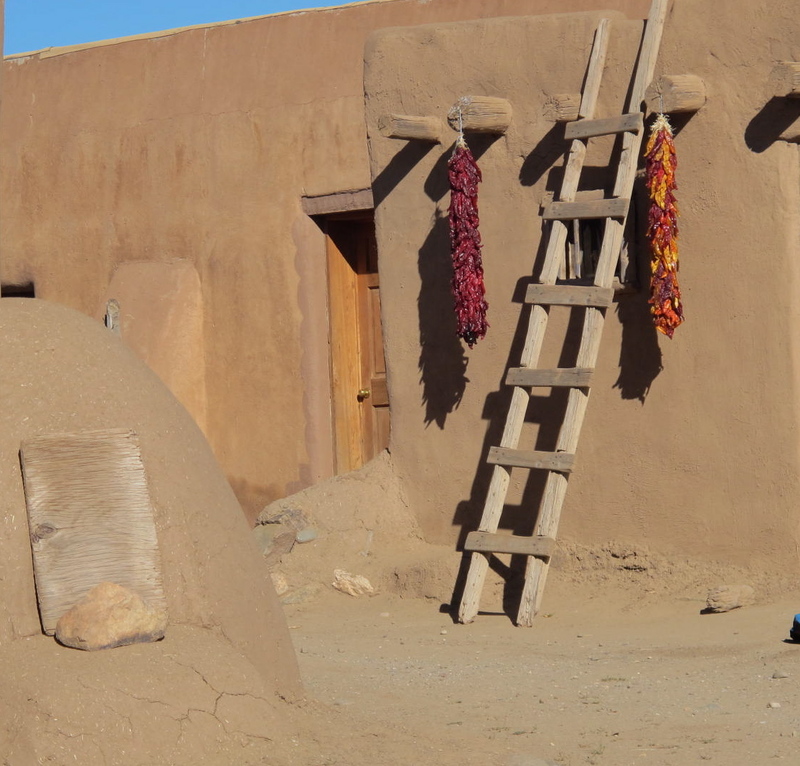 (New Mexico is full of these “oldest,” “most” or “longest.”) Visiting the pueblo is like stepping back in time. 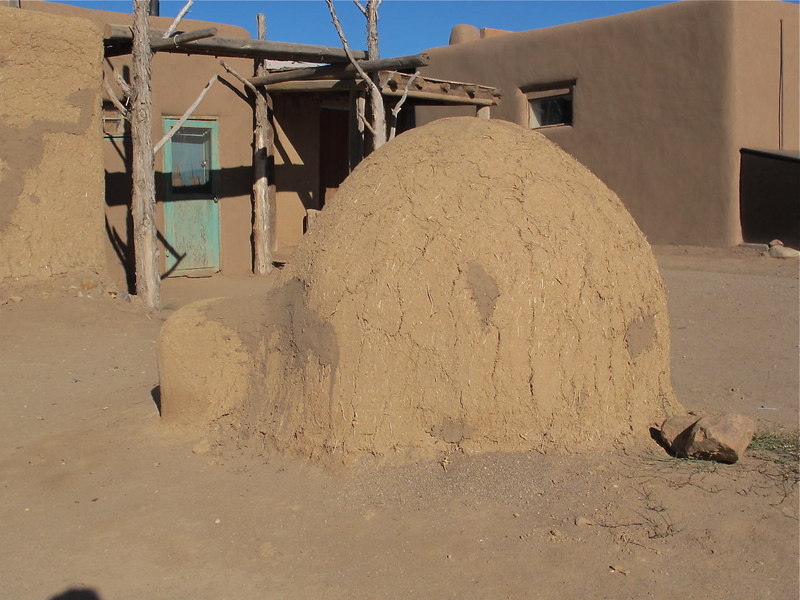 People still live in the pueblos that were built more than a 1000 years ago. The folks who live there today choose to live like their ancestors…without electricity or plumbing. They still get their water from the Red Willow Creek that runs through the center of the pueblo. The only concession they have made is that they now have doors to enter and exit the buildings instead of ladders to climb up to the top of the building. They also have some windows. 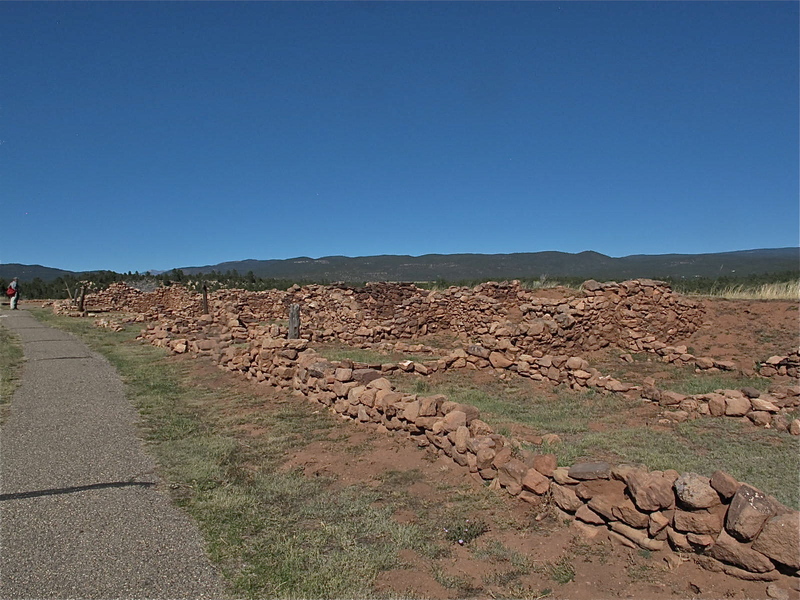 A young man named Kevin took us on a historical tour of the pueblo and explained how they lived before the Spanish arrived, what they have gone through for the last 500 years and how things are today. It was a most interesting tour and Jerri and I learned a lot. This outdoor oven is called an horno (pronounced “orno”) where people still bake their bread, cookies and cakes. The red and multicolored things hanging down are called ristras. The red one is made up on red chiles while the other one is basically ornamental with multi-colored corn ears. 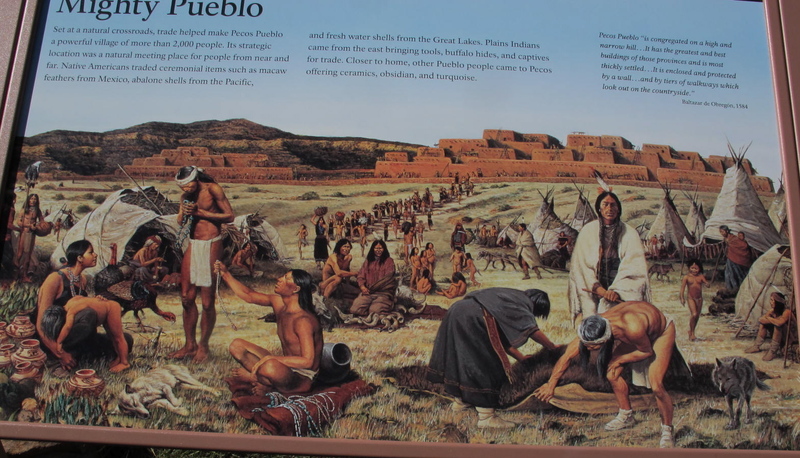 The pueblo people used the corn mostly while the chiles were grown in the southern part of the state. 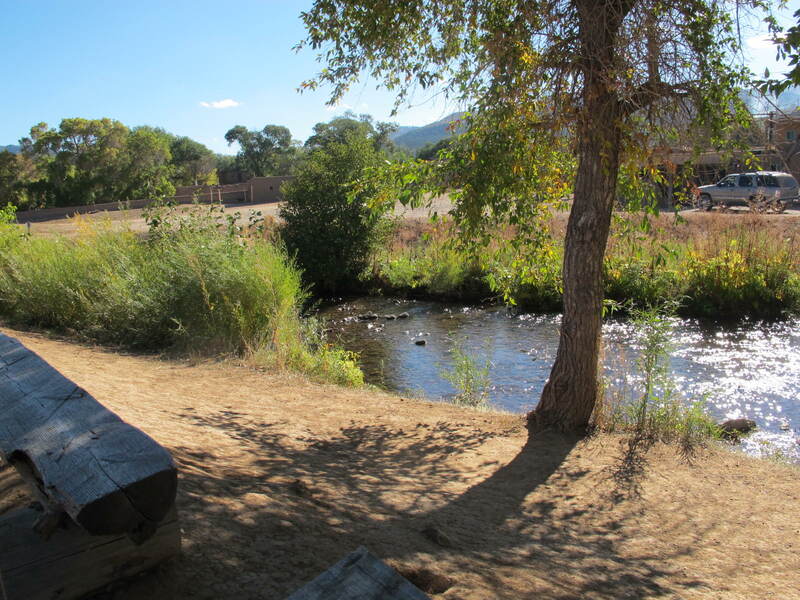 This creek is where the Taos pueblo people get their drinking water. Apparently, they don’t get sick because they have a built in immunity to the cooties in the water. 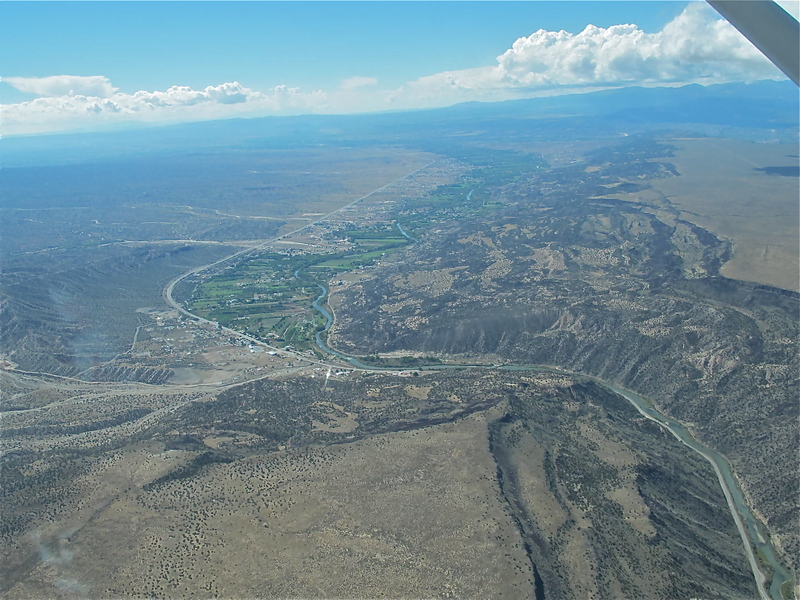 The Rio Grande flows past Taos about 10 miles west of the town. It wasn’t grande when we were there, but, still, it flows through that area in a very deep gorge. A bridge was built in 1965 to transverse the gorge, is 1272 feet long and spans the gorge some 650 feet above the Rio Grande. 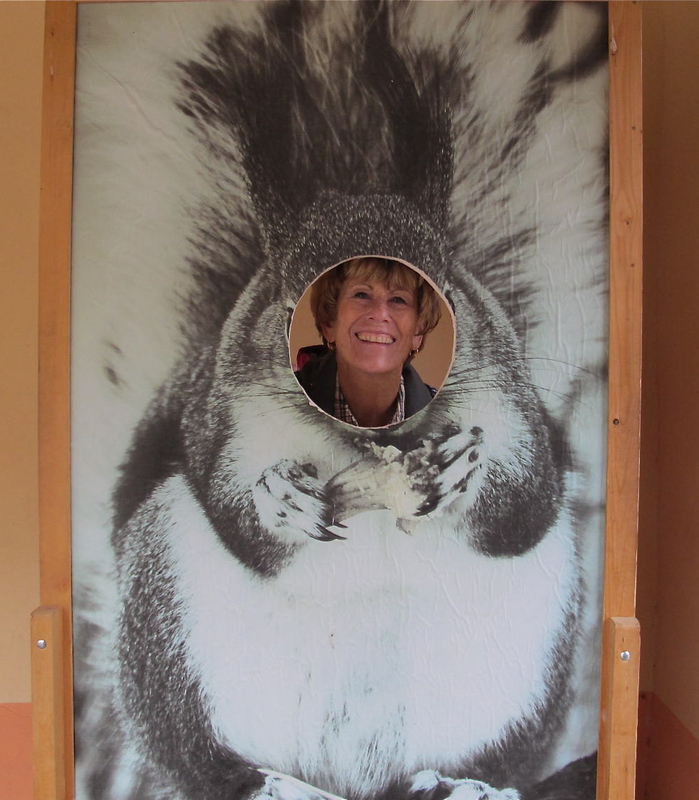 It took quite a bit of gumption for me to walk out on it, but if Jerri could do it, I had to also. Here is proof we did it. 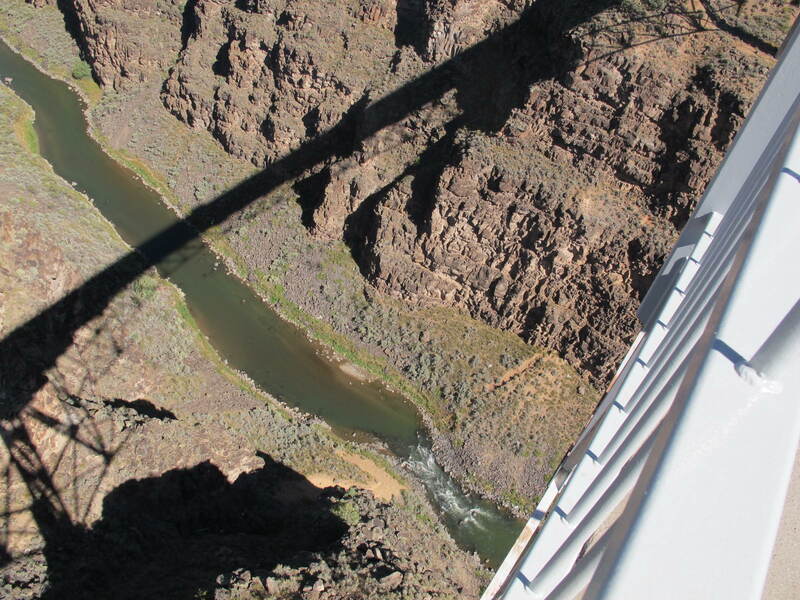 650 feet above the Rio Grande! The Rio doesn’t look so grande from here. There is a rest stop on one side of the gorge where we ate lunch that day. I took this picture as we went back across the bridge, passing many vendors and street performers, all trying to get a buck from passing motorists. It was quite a sight. 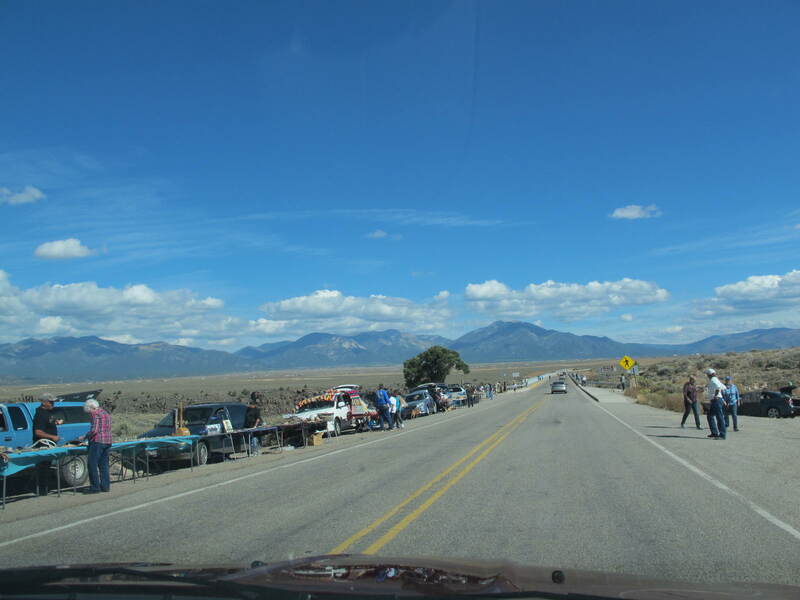 We decided to go on some back roads from Taos to Las Vegas, New Mexico. It’s quite different than Nevada’s Vegas. It was a mercantile center along the Santa Fe Trail during the 1800s before the Santa Fe Railroad arrived. Apparently, there are still visible wagon wheel ruts in certain areas but we never did find them. Still, it’s still a nice little town. 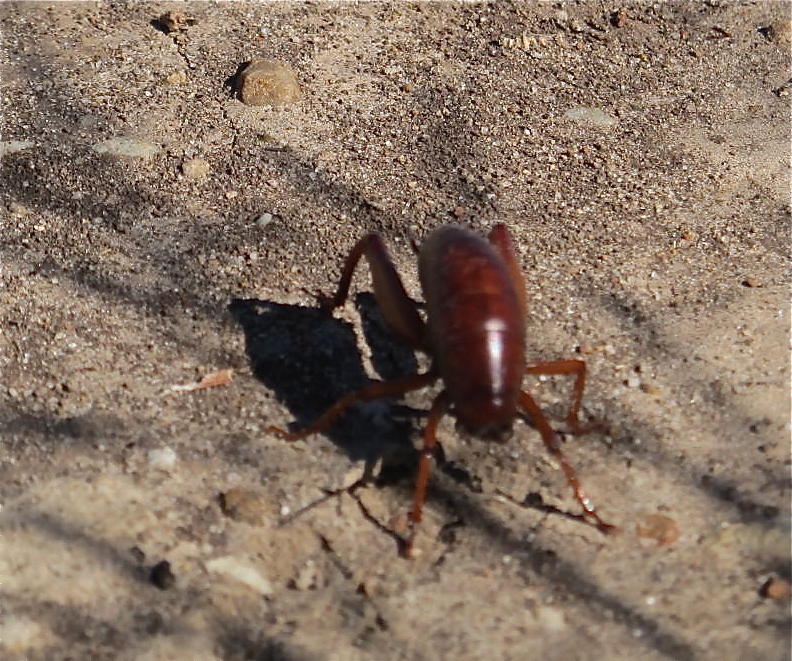 We visited a nature center a couple miles outside of town, but again, saw only what seemed like a million locusts, some strange looking bugs and some kites called Northern harriers. Waiting for the critters to show up, but they didn’t because it was Columbus Day and the center was closed. Who knew? We had seen signs for the “Mother Road,” AKA Route 66 and had been singing terrible renditions of the song when we decided to go to Tucumcari. I liked the sound of the name and wanted to see the place. We headed out across the prairie and in so doing saw more than 150 pronghorns. I quit counting at that point. They were in groups of 3 or 4 on up to 30 or more. So pretty dotting the landscape. They were always off in the distance, so we never got a picture of them. Bummer. An old Route 66 sign in front of an abandoned motel. Wow! 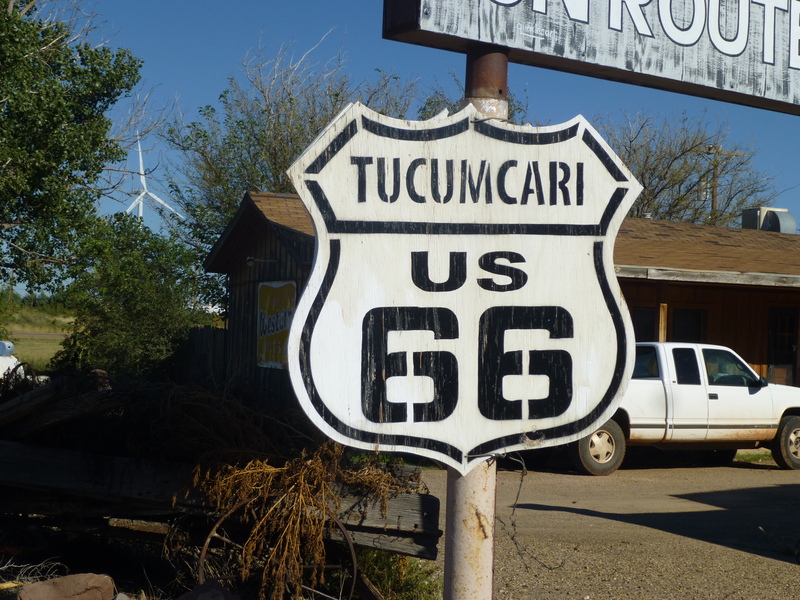 Tucumcari is a living example of what happens to a town when the Interstate bypasses it. There are many abandoned buildings along the main streets and it just appears to be totally dry and dusty. It just seems to be a dying town. BUT, there is hope. There is the Mesalands Community College in town that is helping the economy and Tucumcari boasts a new high school. Perhaps education will help these folks to turn around the town. I hope so. 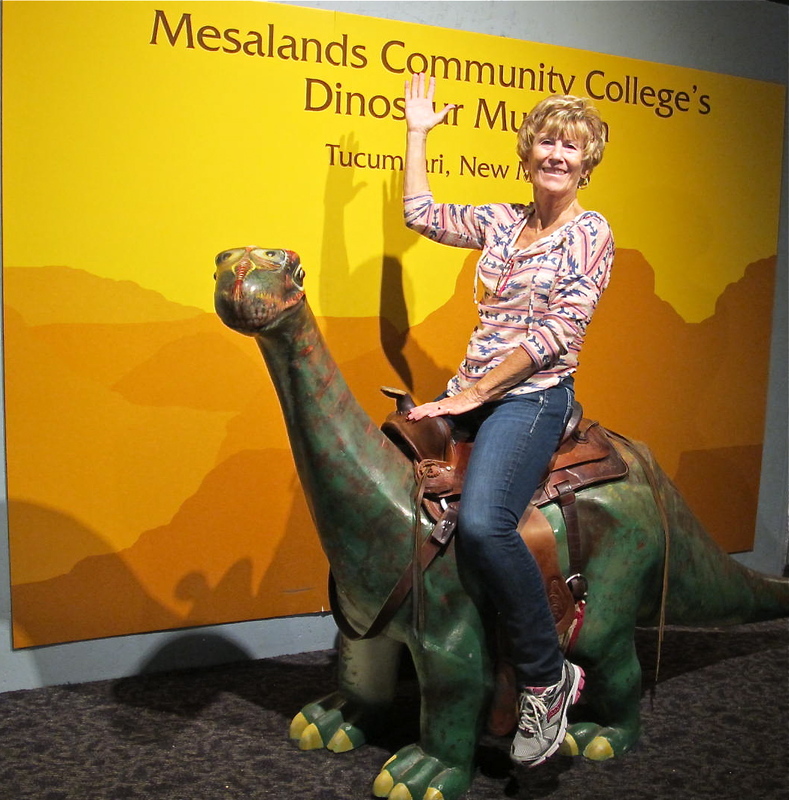 We did visit the Mesalands Dinosaur Museum and enjoyed their well done displays. It’s relatively small, but I think it rivals the Dinosaur Journey in Fruita, CO. It was national Fossil Day, so admission was free. You can imagine the jokes we made about that. 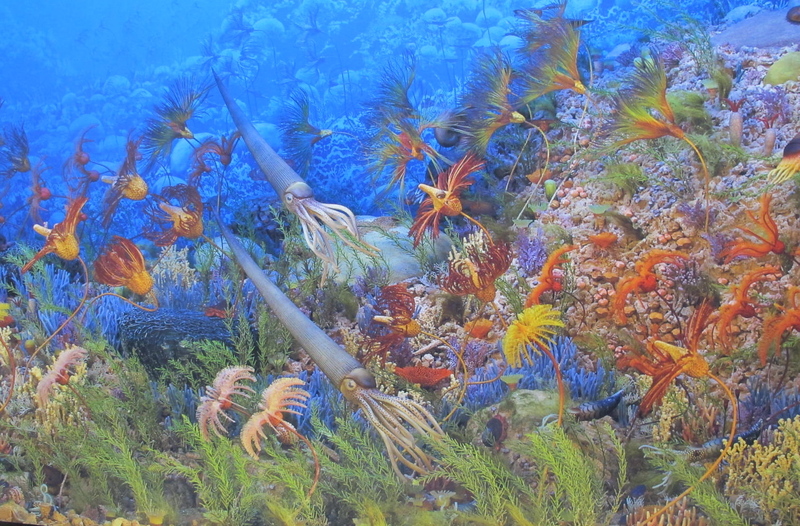 This is a background painting for their Divonian Sea exhibit. The large animal here is Struthiomimus, a type of meat-eating dinosaur. Its relatives evolved into modern birds. 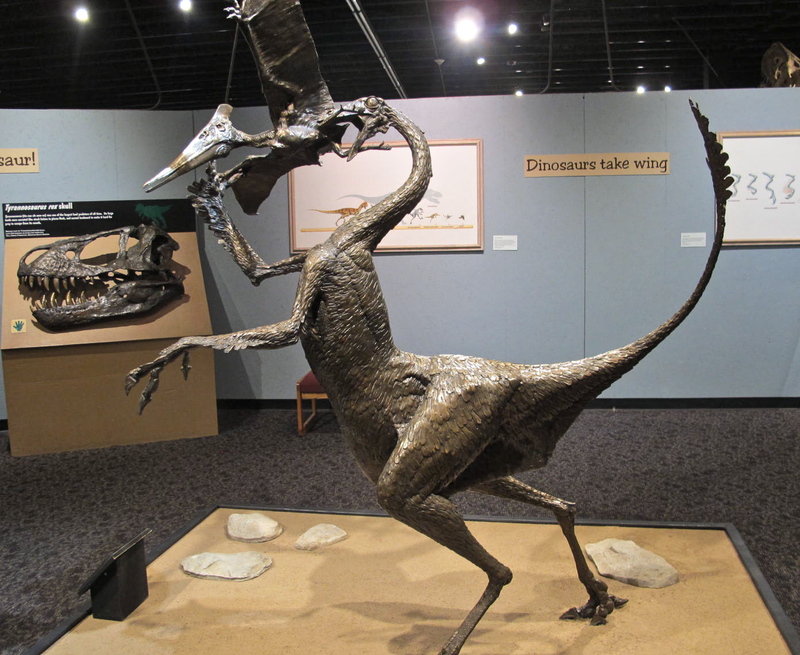 Its winged prey is Nyctosaurus, a distant relative of birds. There were lots of things to touch and have fun with, so fun we had. This was the local transportation before Route 66 came through in 1920. We left Tucumcari and drove to Albuquerque, our last stop before going home. That drive was pretty fast as New Mexico’s interstate speed limit is 75. 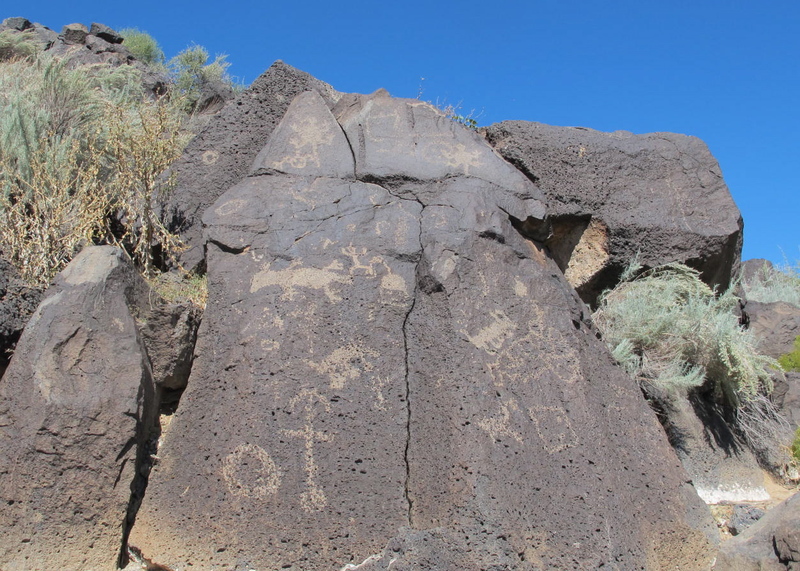 That afternoon, we visited the Petroglyph National Monument. What an interesting place!. 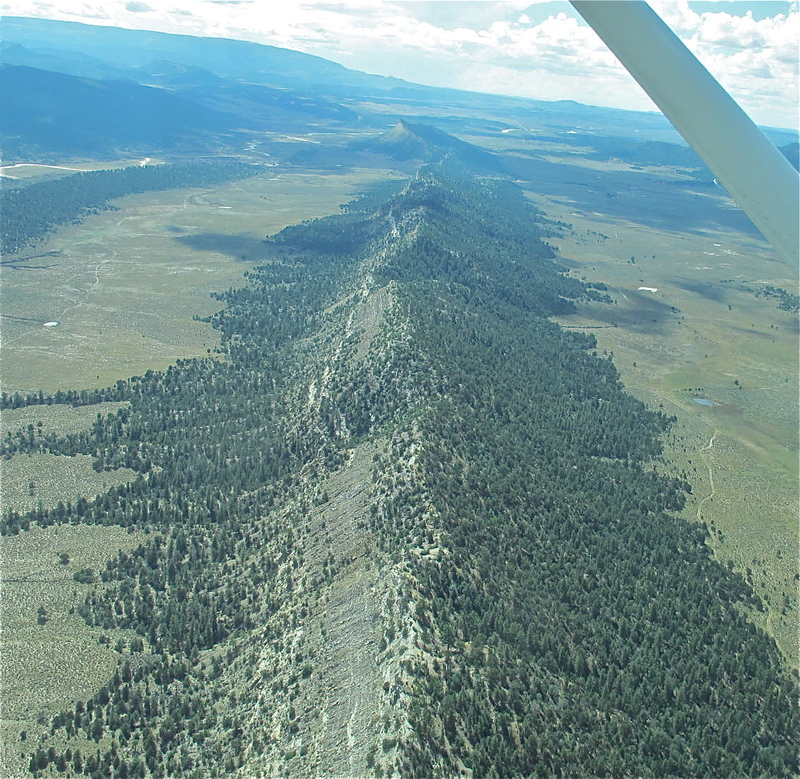 There are about 20,000 documented images in three different areas of an escarpment created by a series of volcanic eruptions. 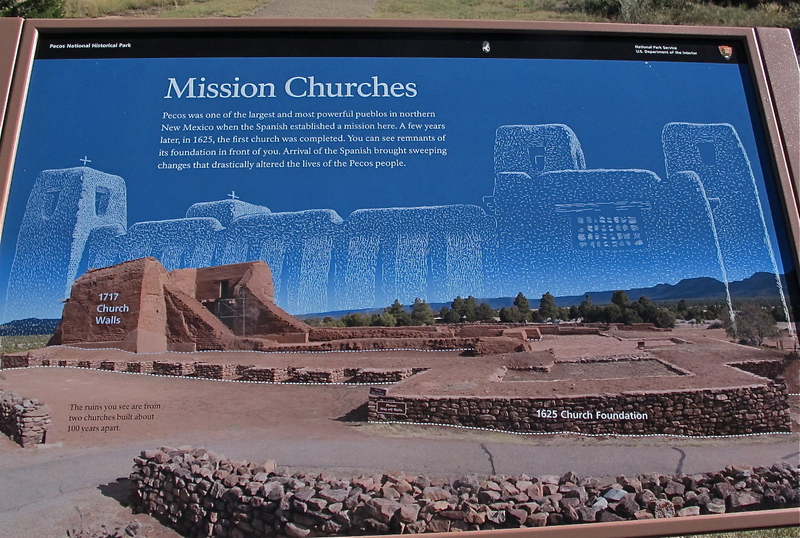 The images were created between 400 and 700 years ago by the ancestors of today’s Pueblo people and other native groups traveling through the area. Some images might be 2,000 to 3,000 years old. We watched a film introducing the area and showing us what to look for…although they are pretty obvious because there are so many. 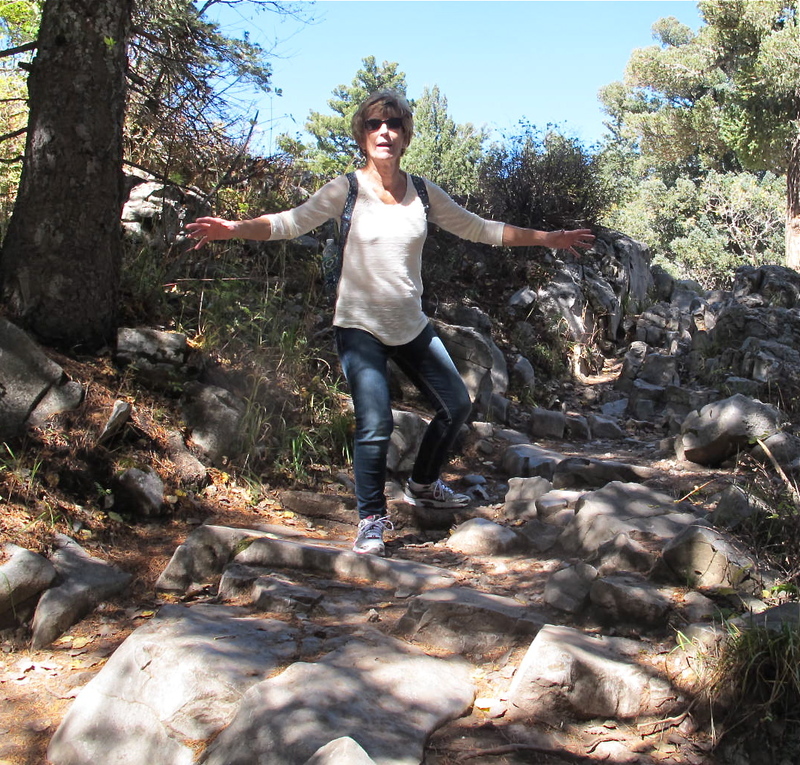 Of course, Jerri had to use the facilities and was walking to the pit toilet when she almost stepped on a rattlesnake. We have no record of this because she couldn’t get her camera out of her backpack before he slithered away. Should we trust her? I think so. She was too excited to have been making up this little meeting. She said he was about 3 feet long with maybe 2 to 3 inches of rattles. 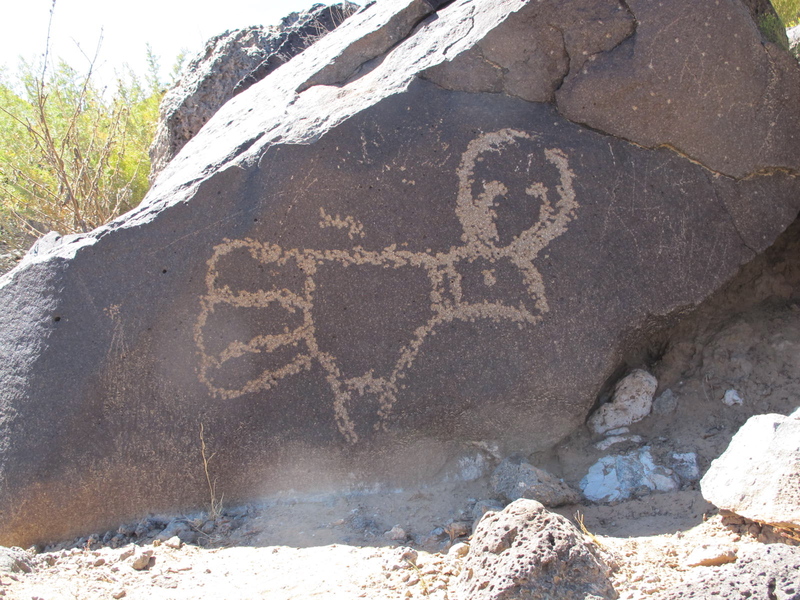 We chose to go to the Piedras Marcadas Canyon (canyon of marked rocks) because it had the most petroglyphs and was the least visited. 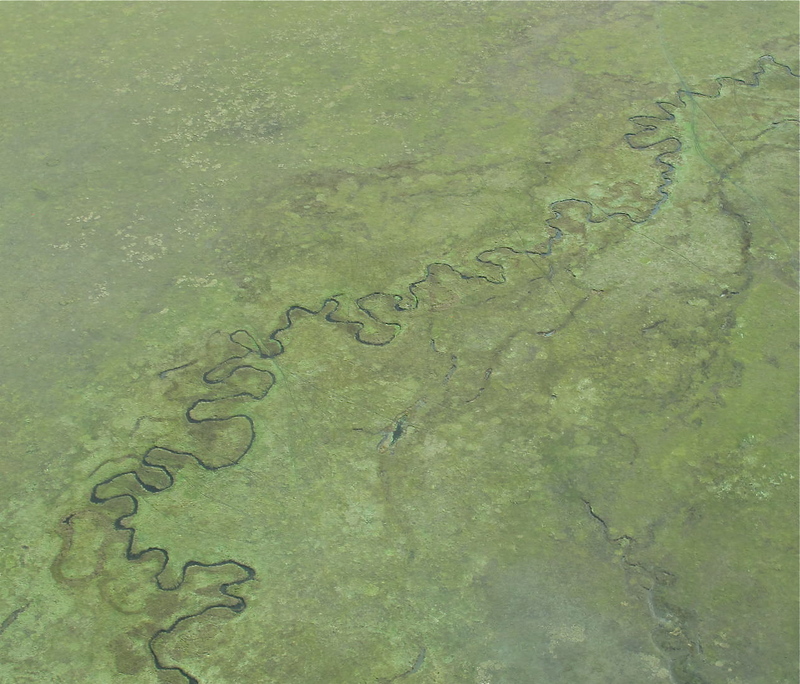 Here are some of the images we saw. 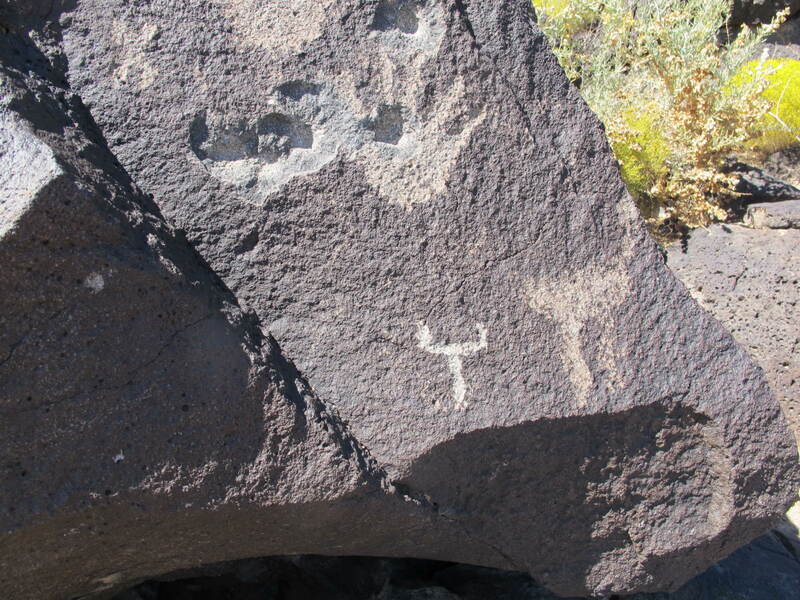 Sadly, some folks thought the petroglyphs were best used for target practice, thus defacing some of them. Those pock marks you see are bullet marks. 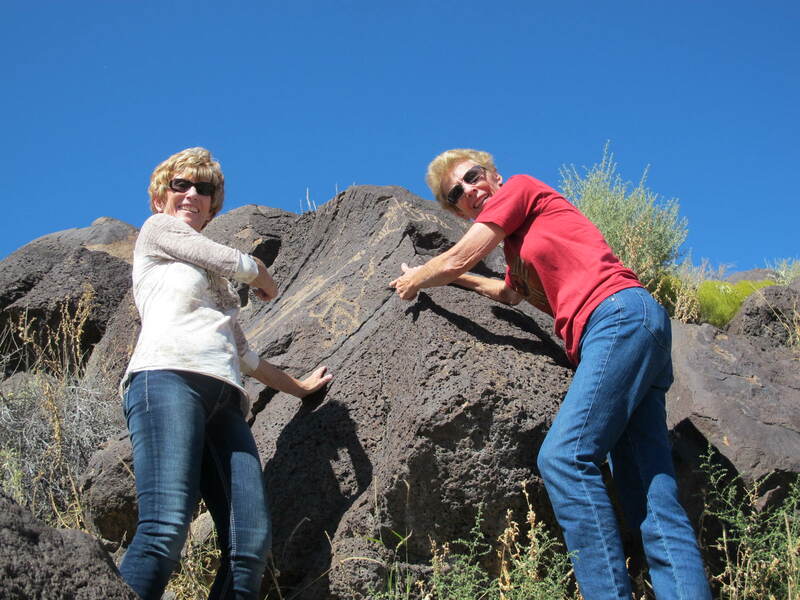 I am surprised that there is not more defacing and vandalism because the particular canyon we were at in not more than 100 yards from a housing development. Good for the people of New Mexico! We took tons of pictures as the images were literally right next to each other. We could have seen more but the heat got to me and I had to rest a bit before we walked back to the car. I know better than to not stay hydrated but didn’t follow the rules. What a doofus. The next day was an exciting adventure. 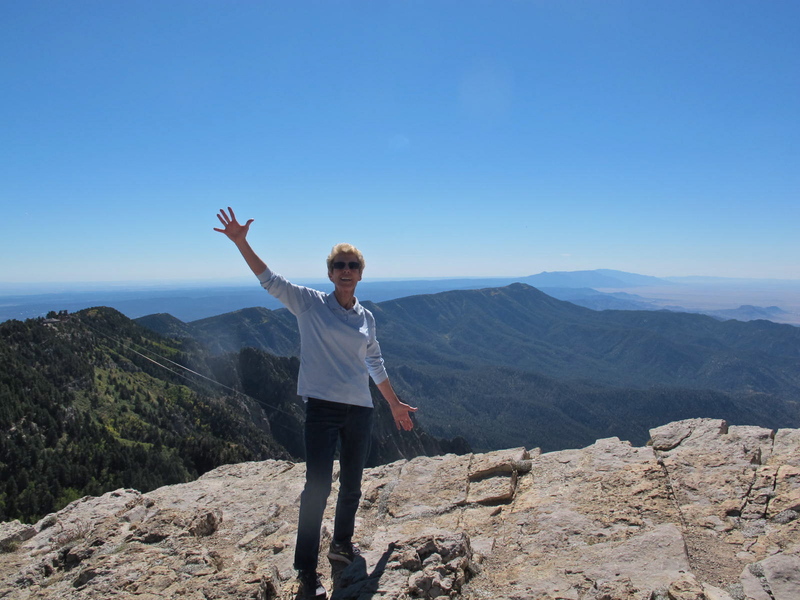 We rode the tram up to Sandia Peak and then hiked around the mountain top. Oh my goodness, what a view!!! You can see more than 15,000 square miles of area from the peak. We know we saw Mt. Thompson and that is at least 80 miles away from the peak. The tram docks at 10,378 feet and we hiked higher than that to get to what is called the Kiwanis Cabin. 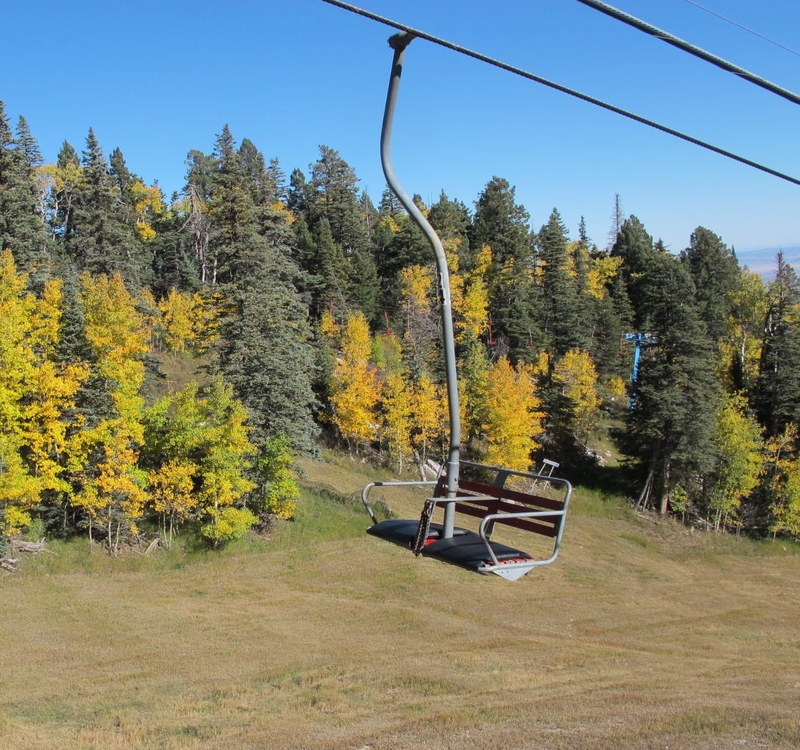 But first, we walked around a bit and discovered a ski lift going down the other side of the mountain. 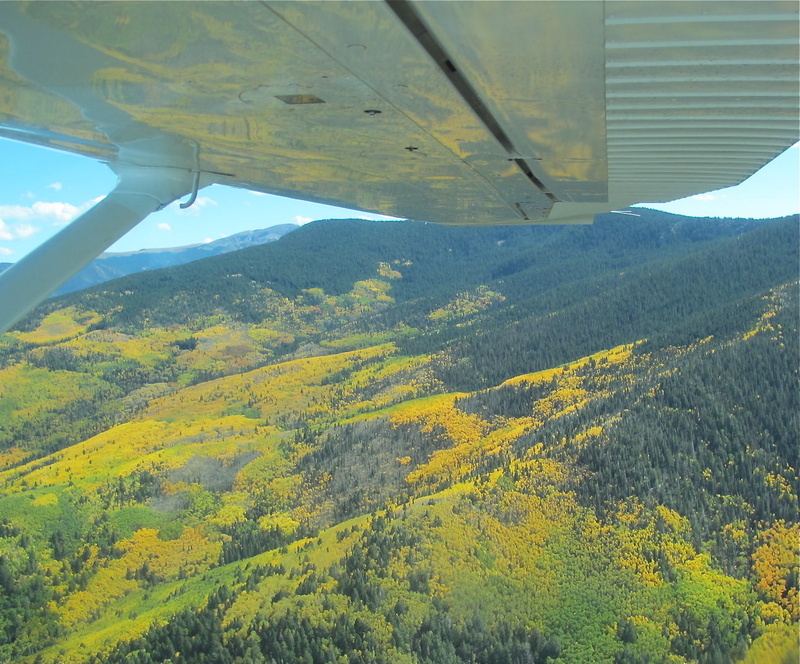 Again, we took a jillion pictures of the aspens and other trees. 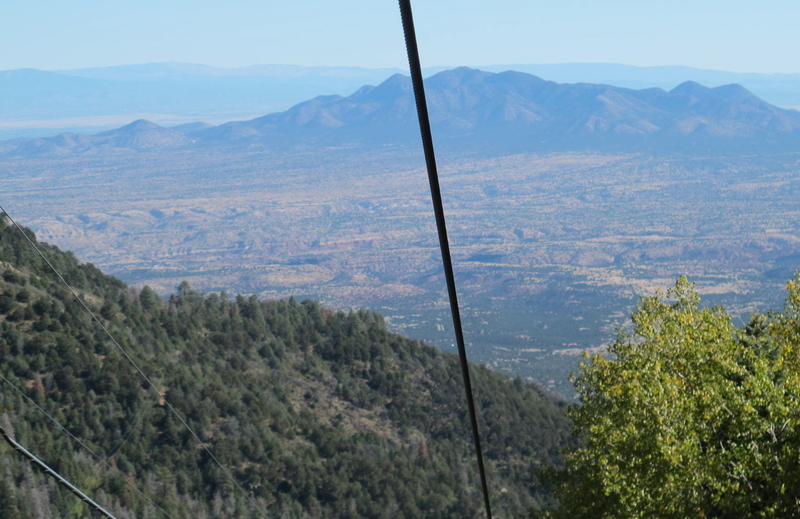 The view on the east side of the mountain was spectacular and looked down on the Turquoise Trail that Jerri and I had taken to Santa Fe a few days before. The hike to the Kiwanis Cabin was about a 3 mile round trip but not too strenuous. We did pretty well on it. 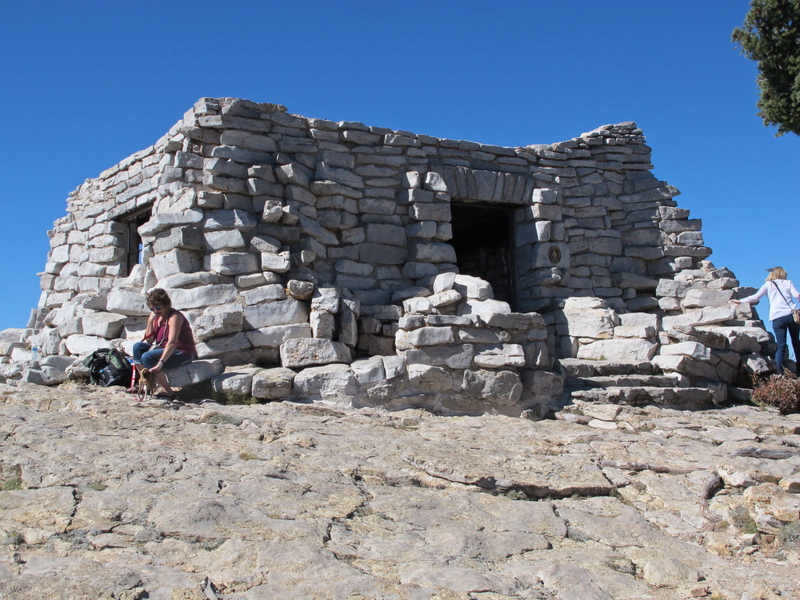 The Albuquerque Kiwanis Club built the first cabin in the early 1920s. 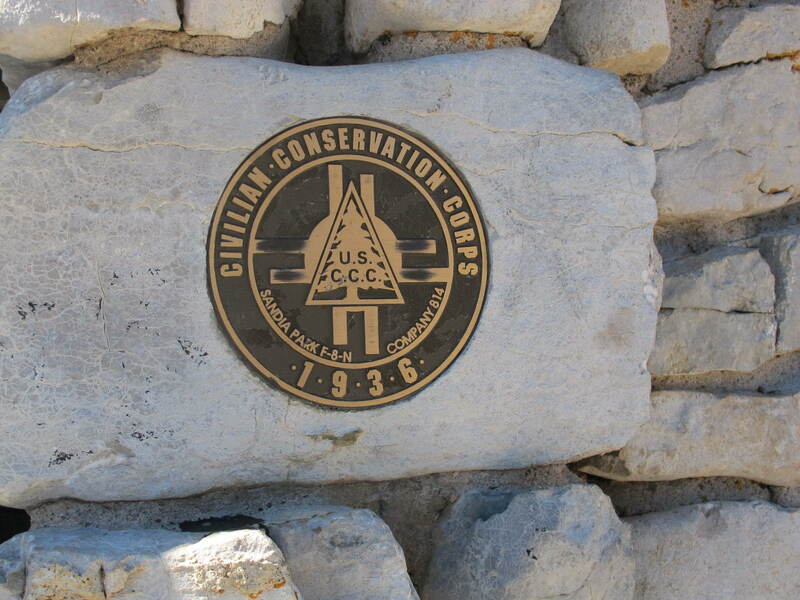 It burned a couple of times and was finally reconstructed by the CCC camp at Sandia Park in the 1930s. We liked this cabin because our dad was in the CCC and our uncle is a long time member of a Kiwanis group in Aurora, CO.
We saw this little squirrel with his pine cone while we were eating our lunch near the cabin. He was a cutie. 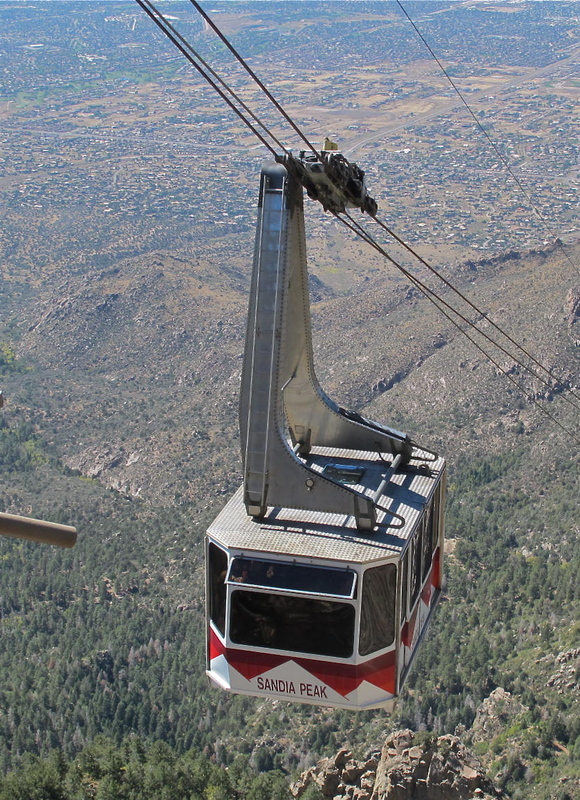 We didn’t really think about the altitude until we got back to the tram and saw several people having breathing issues. Jerri helped a gal while we were waiting for our tram. She ended up needing oxygen on the way down. There was a teenager on our return tram who needed oxygen on the way up and never got off the tram until we docked at the lower level. I guess living at the altitude we do and also working out helped us in our activities on this trip. 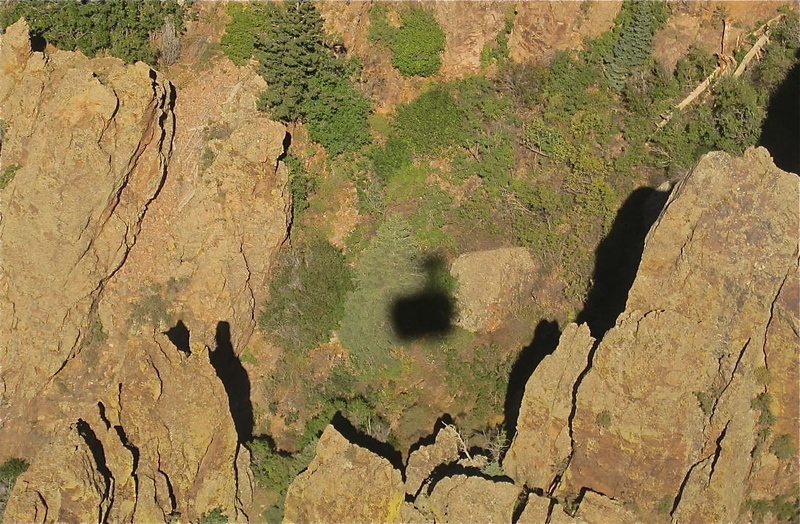 The shadow of our tram going down hill. 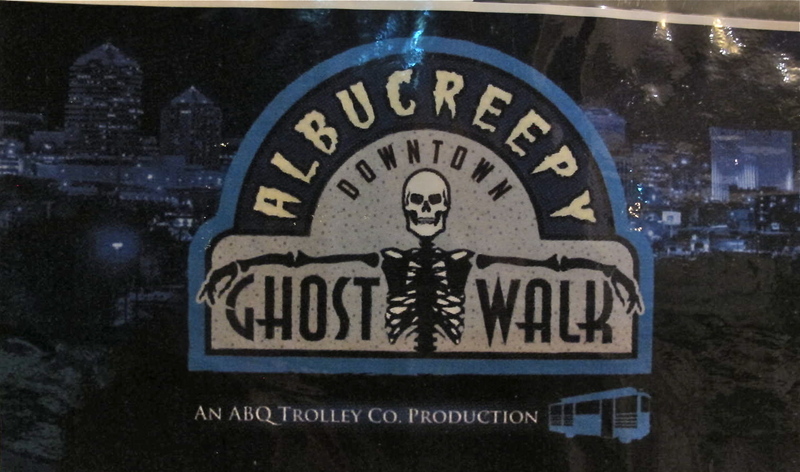 We went on a ghost tour that night but didn’t see any ghouls, spirits or spiders. 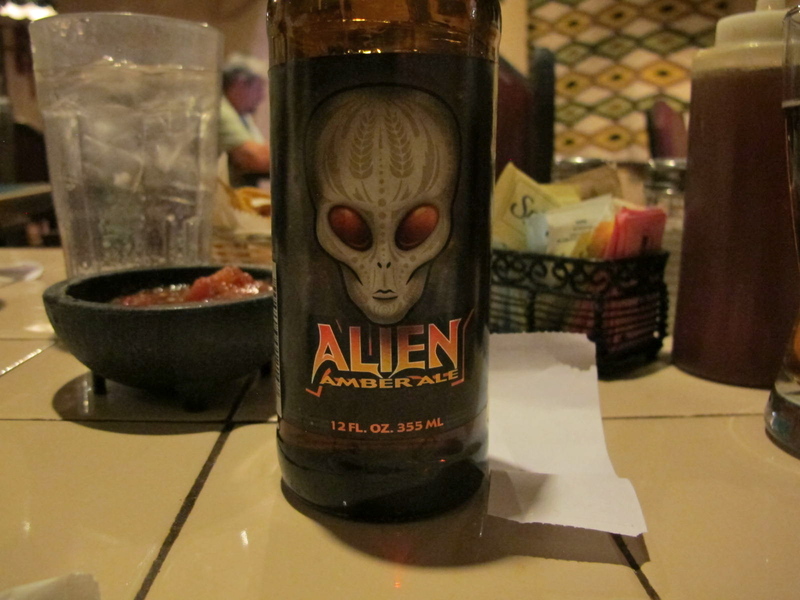 The only alien I saw was the amber ale I drank at dinner. Our last day was spent driving out I-25 to see the Pecos National Historical Park. 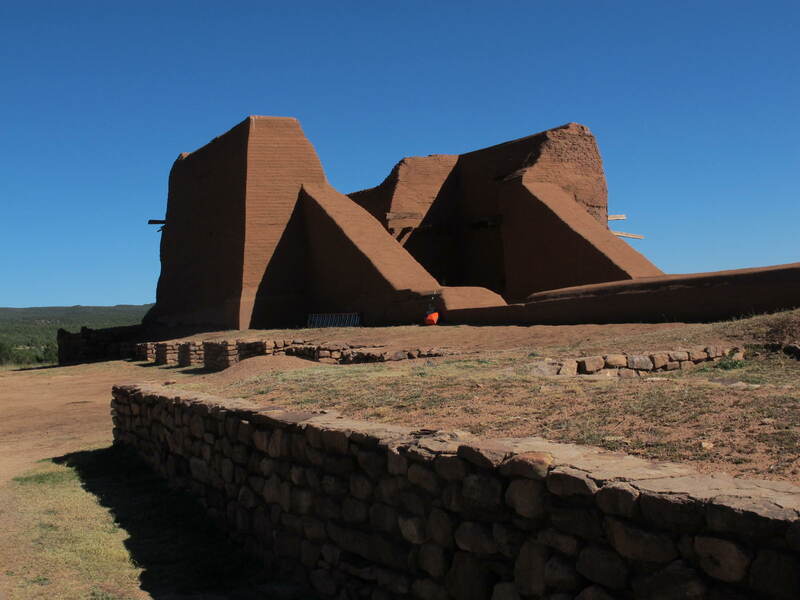 It preserves the ruins of one of the largest ancient pueblos as well as two mission churches built by Franciscans in the 17th and 18th centuries. 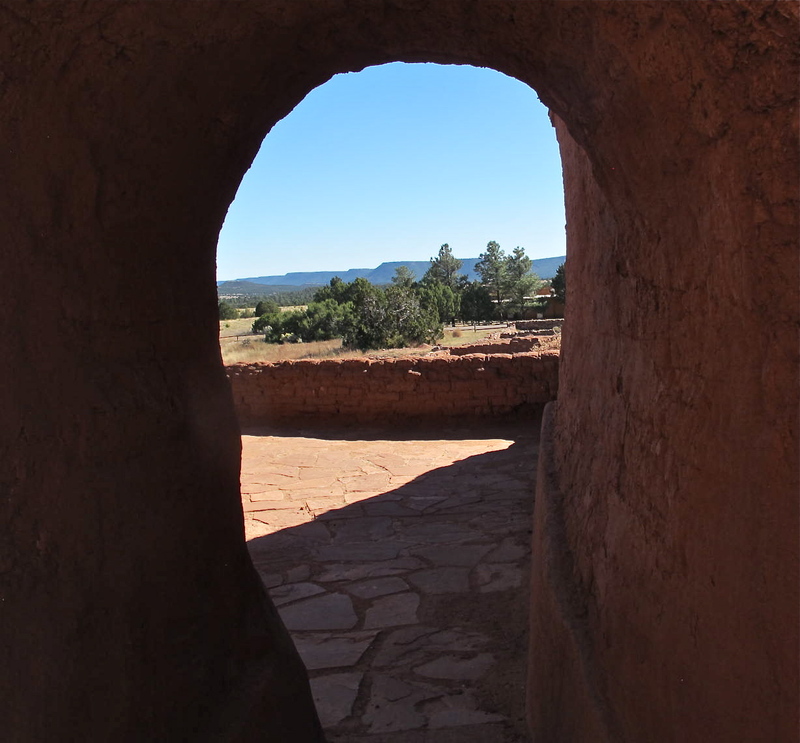 The park brochure says this area is a cultural crossroads because for over 10,000 years this landscape has been the backdrop to a continuously unfolding story of human culture: Pueblo and Plains Indians, Spanish conquerors and missionaries, Mexican and Anglo armies and settlers traveling the Santa Fe Trail. 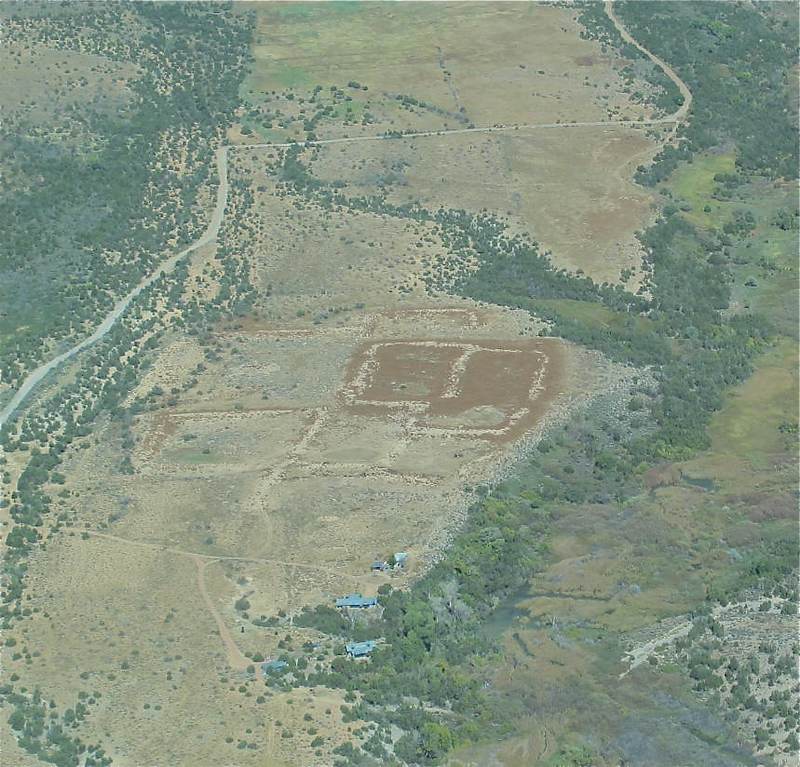 You can see how the pueblo would have looked about 1625. This shows what the ruins look like today. It’s an interesting place in which your imagination can run wild if you let it. 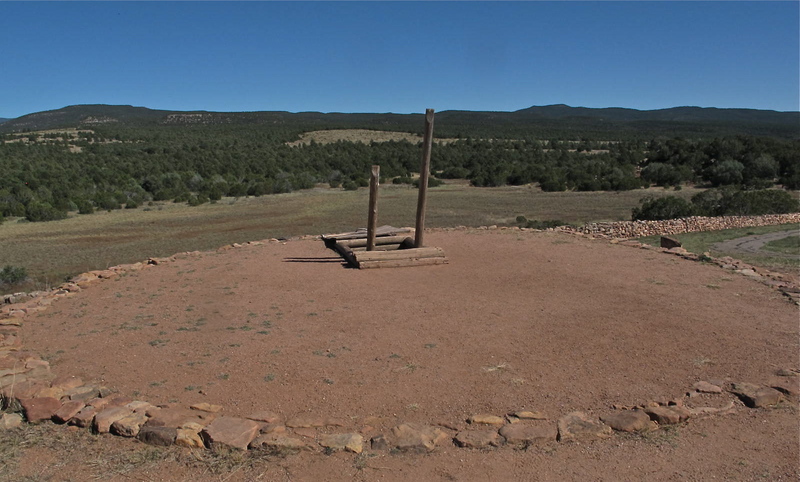 We got to go inside a reconstructed kiva where ceremonies and social events would have taken place for the Pueblos. This shows an overlay of the two churches that were built here. 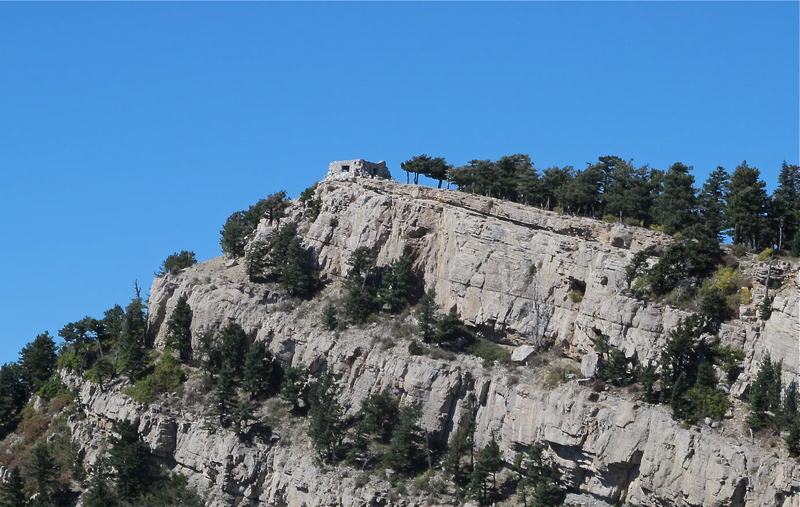 The second was smaller due to a smaller Pueblo population. This is a view from one of the church exits near the altar. 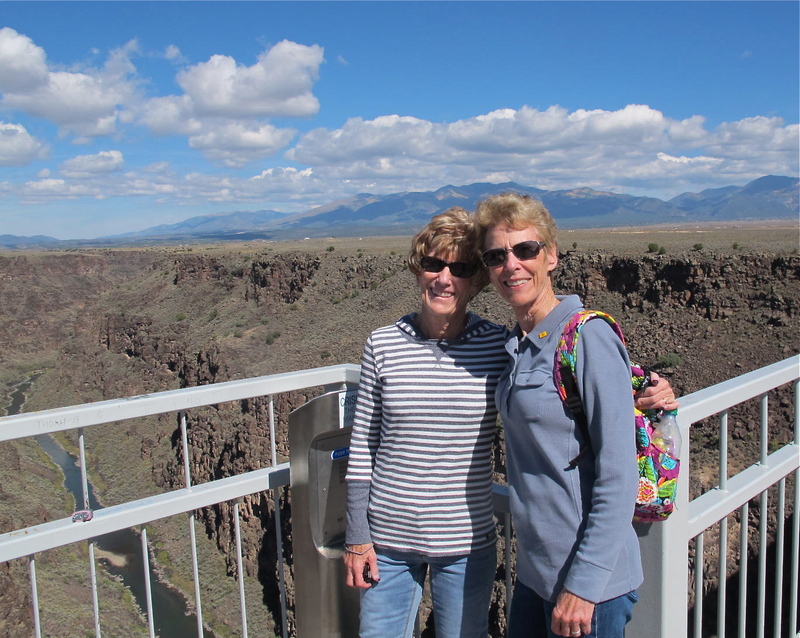 Jerri and I loved the part of New Mexico that we saw. The many faces of the landscape reminded us somewhat of Nevada, but NM has more colors, I think (although I haven’t seen all of Nevada yet). We liked the pace of the towns…much more relaxed than last year’s trip to Boston. The people were so friendly and we enjoyed chatting with them. 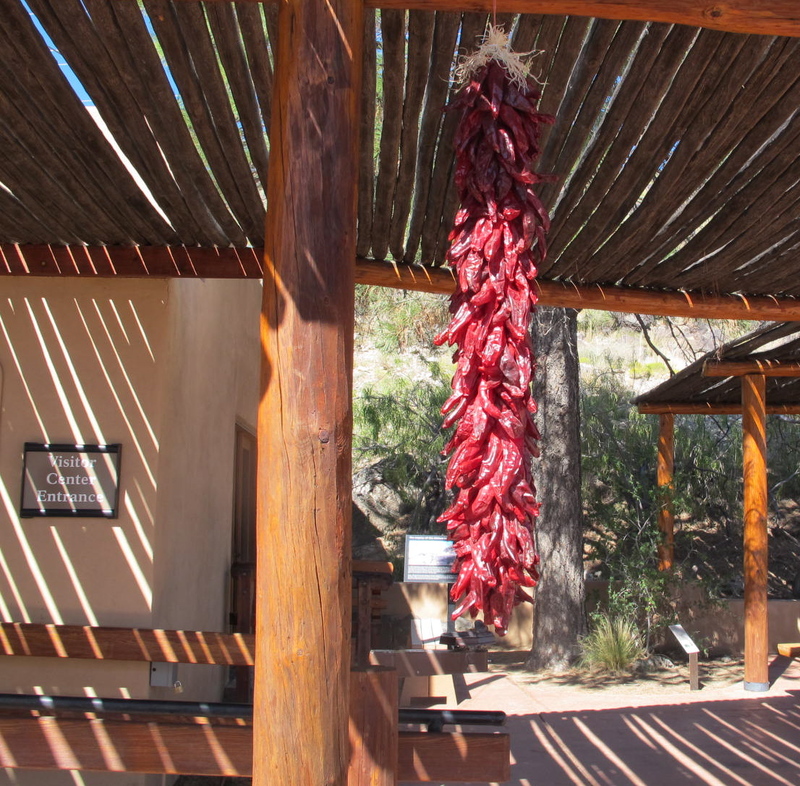 We learned to answer New Mexico’s official state question: “Red or green? “ That is to say what color of chile would you like on your food. I would say, Christmas because I liked both flavors. Jerri would usually say green because it’s a bit milder. We would like to go back some day to see more of the state. Another ristra. We wanted to bring one home but they were pretty expensive and we didn’t ask if they could be shipped. Maybe next time.